Under-actuated Prosthetic Hands, the Luke Hand Project, Yale Grab Lab. We based the physical design of our prototype on current prosthetic technology, but wanted to approach how the hand is controlled in a novel way. Smart Hand uses object recognition, vision processing, and sensor feedback to grasp at commonly used objects. It can detect when it is approaching an object and will adjust how it grabs the object. 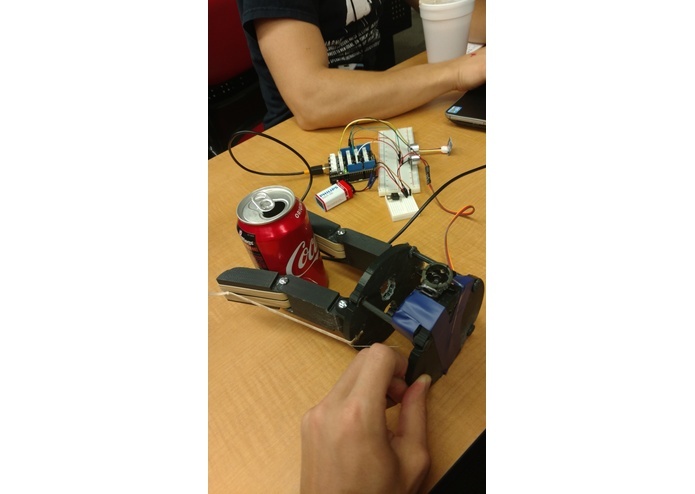 We 3d printed the hand, used a servo motor and a series of cables to move the claw, an Arduino 101 that controls the servo motor that moves the cables, along with an ultrasonic rangefinder and touch sensor. A computer to integrate with the Arduino board, and use of Microsoft Azure for our machine vision and object recognition. Nick: "I built the Arduino part of the project. I used the Arduino IDE to program an Arduino 101 so that it would read values from an ultrasonic rangefinder and grove touch sensor. I also programmed it to rotate the servo motor that was responsible for controlling our claw prototype. I also helped with assembling the prototype." Andrea: "I was in charge of building the physical prosthetic. I used Solidworks to model the claw then 3D printed the parts for assembly." Eric: "I setup our virtual-machine-based web server on MS Azure and set up REST endpoints to receive video frames to visually analyze." Daniil: "I programmed the color-based object tracking, width detection, and arduino serial interfacing class." 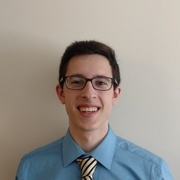 Nick: "I had issues with my Arduino board at first and came across a very common bug that forced me to downgrade from the most recent version of the Arduino IDE. I also was not very experienced in Arduino so I had to teach myself how to use it throughout the competition." Andrea: "The 3D printer failed about four times, so I had to finish assembling the claw last minute. On top of that, I realized I made a couple errors in the CAD and didn't have enough time to print new parts, so I had to make do with the parts and a file." Dan: "Dragonboard was not an option for us. It didn't work, kept crashing, and wasted a lot of our time, and we had to switch to just using our laptops." Nick: "My favorite moment was when I first ran my program that would allow the motor to close the hand because we were able to pick up a cup on our first try. To see the prototype in action was incredible and made me feel like I had done something amazing." Andrea: "The best part for me is always when you first see your parts come off the printer and the pieces fit together like a puzzle. Despite the couple CAD errors, everything fit together almost exactly as I intended." Nick: "I definitely learned a lot about Arduino programming. I know I'll put these skills to use in my classes and clubs." Andrea: "Start printing ASAP so you have time to make improvements." Very few similar ideas to Smart Hand exist. The technology is very new and experimental, many similar designs are still in the research phase and nowhere near commercialization. Smart Hand aims to be the first commercially available prosthetic hand that uses machine vision and object recognition by using cheap, available materials and hardware for its design. "I built the Arduino part of the project. I used the Arduino IDE to program an Arduino 101 so that it would read values from an ultrasonic rangefinder and grove touch sensor. I also programmed it to rotate the servo motor that was responsible for controlling our claw prototype. I also helped with assembling the prototype."